Joseph Louis Barrow (May 13, 1914 – April 13, 1981), better known in the boxing world as Joe Louis, and nicknamed the Brown Bomber, is regarded as one of the greatest heavyweight boxing champions of all time. He held the heavyweight title for over 11 years and made 25 successful heavyweight title defenses, a record that currently still stands. In the years preceding World War II and the rise of the racist German Nazi regime, Louis, like Olympic athlete Jesse Owens, became a popular American hero for both black and white America. His athleticism and the probity of his life earned wide respect and helped bridge the color barrier in American sports, leading, in 1949, to Jackie Robinson's historic signing by baseball's Brooklyn Dodgers. In 2003, Ring Magazine rated Joe Louis No. 1 on the list of 100 greatest punchers of all time. In 2005, Louis was named the greatest heavyweight of all time by the International Boxing Research Organization. Born in Lafayette, Alabama, the seventh of eight children, Joe Barrow Louis was the grandson of slaves and one quarter Cherokee Native American. His father, Barry Barrow, was a sharecropper, and when Louis was only two years old, his father was committed to an asylum, where he would die just two years later. His mother remarried a widower who brought an additional eight children to the household, and when Joe was seven, the family moved to Detroit. In his teens, he worked for an ice company and would later credit lifting the heavy blocks of ice with helping build his arm and upper body strength. It was during this time that he first became interested in boxing. Uninterested in school, Joe discovered Brewster's East Side Gymnasium, first establishing his love for boxing. In order to keep his mother from finding out, he changed his name to Joe Louis, but to no avail, as his mother would later discover the new pastime. Louis had a successful amateur career, winning 50 of 54 bouts and winning Michigan's Golden Gloves title. He soon came to the attention of John Roxborough, one of the local gambling kingpins, who, with Julian Black, a speakeasy owner who also ran numbers, convinced Louis to turn pro. Louis made his debut on July 4, 1934, knocking out Jack Kracken in the first round in Chicago, Illinois. He won 12 fights that year, all in Chicago, 10 by knockout. Originally, Joe's trainer, Jack Blackburn, wanted him to only fight other African-American boxers, but Louis decided to fight white boxers as well. In 1935, Louis fought 13 times, creating a sensation. He knocked out former world heavyweight champion Primo Carnera in six rounds, then knocked out the iron-chinned former heavyweight champion Max Baer in four rounds. Before losing to Louis, Baer had been knocked down only once, by Frankie Campbell. Louis also knocked out Paolino Uzcudun, who had never been knocked down or out before the Louis fight. Louis married Marva Trotter two hours before his fight with Baer in September 1935. He then completed the fight and had the marriage celebration the same night. Trotter would divorce Louis in 1945, remarry him in 1946, and then divorce him once again in 1949. In his next fight, he was matched with former world heavyweight champion Max Schmeling. Although not considered a threat by Louis, the German had studied Louis' style intently, and believed he had found a weakness. By exploiting Louis' habit of dropping his left low after a jab, Schmeling handed Louis his first loss by knocking him out in round 12 in New York. Despite the loss, Louis was awarded a title shot by champion James J. Braddock after negotiations with Madison Square Garden's number one contender, Max Schmeling, broke down. Braddock, looking to retire on a large payoff, was promised a more lucrative fight with the Brown Bomber after Louis bounced back up the pecking order by knocking out former champion Jack Sharkey. Schmeling and the Nazi government were furious, insisting that a win over highly ranked Sharkey did not reverse the Louis defeat by Schmeling, which was considered a title eliminator. The matter was settled in court, and Madison Square Garden and Schmeling lost. The fight was staged in Chicago, and despite a knock down in round 1, Louis defeated the plucky "Cinderella Man" by knock out in round 8. On June 22, 1937, Joe Louis became heavyweight champion of the world. One year to the day after Louis was defeated by Schmeling, a rematched was arranged. The bout is considered among the most meaningful in history, not because of the ramifications as related to boxing, but because of the political and racial overtones of the black American facing off against the white German Nazi champion. Prior to the fight, Hitler purportedly sent a message to Schmeling warning him that he was fighting not only for the title, but for the Third Reich as well. In the ring, Louis knocked down Schmeling three times in front of 70,000 people at Yankee Stadium before knocking him out in only a little over two minutes. From December 1940 to March 1942, Louis defended his title ten times, a frequency unmatched by any heavyweight champion since the end of the bare knuckle era. His frequent fights against every challenger, and his convincing wins, earned his opponents the sarcastic nickname "Bum of the Month." In all, Louis made 25 defenses of his heavyweight title from 1937 to 1949, holding the heavyweight title for 11 years and 10 months. Louis set records for all divisions in number of defenses and uninterrupted longevity as world champion, records which still stand. His most remarkable boxing achievement is knocking out 23 opponents in 27 title fights. His fight with world light heavyweight champion John Henry Lewis, knocking him out in the first round. Lewis was the first black boxer Louis fought professionally and a close friend as well. However, Louis would easily win the fight. His fight with "Two Ton" Tony Galento, who knocked Louis down in the third round with a left hook. Later giving Galento a terrible beating, Louis knocked Galento out in the fourth round. His two fights with Chilean Arturo Godoy. In their first bout Louis won by a decision, and then Louis won the rematch by a knockout in the eighth round. His fight with world light heavyweight champion Billy Conn, the first of which is remembered as one of the greatest fights in heavyweight history. Conn, smaller than Louis, said that he planned to "hit and run," prompting Louis's famous response, "He can run, but he can't hide." It seemed that Louis was on the verge of losing his title after 12 rounds, as he trailed by three and two rounds on two officials' scorecards. However, Conn, ignoring his corner's instruction to box with caution, was knocked out by Louis with two seconds left in the 13th round. Louis served in the Army from 1942 to 1945, fighting nearly 100 exhibition fights and spending that period traveling throughout Europe visiting with the troops. 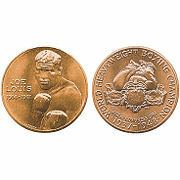 Louis donated his winnings from a January 1942 fight with Buddy Baer to the Naval Relief fund. In similar fashion, he donated his winnings from a fight with Abe Simon to the Army Relief fund. In that same year, Louis enlisted as a private in the Army, earning $21 a month. Louis served with future baseball great Jackie Robinson, who would later credit Louis with helping blacks in what was then a segregated army. Louis served for nearly four years in the Armed Forces and would retire as a sergeant with a Legion of Merit decoration. The army banned Louis from title fights while in the service, thus Louis' rematch with Conn was a comeback fight in which he knocked him out in the eighth round. Louis would go on to win three more fights, including two fights with Jersey Joe Walcott. In the first fight, Walcott scored two knockdowns over Louis but lost a disputed decision. In the second fight, Walcott again knocked Louis down, but the aging Louis came on to knock out Walcott in the 11th round. On March 1, 1949, Louis announced his retirement, seemingly realizing that he was not the fighter that he once was. Then in 1950, in financial trouble, he announced a comeback, losing a 15-round unanimous decision to world champion Ezzard Charles, who had won the vacant title after Louis' retirement. More overweight now than heavyweight, and much slower than he had been in his prime, Louis kept boxing, but at a level far below that of his championship days. In 1951, Louis lost by a knockout in eight rounds to the future world heavyweight champion Rocky Marciano. He then retired from boxing with a record of 69 wins and 3 losses, with an amazing 55 of those wins coming by knockout. During his later years, Louis invested in numerous different businesses, including the Joe Louis Insurance Company, a softball team named the Brown Bombers, the Joe Louis Restaurant, Joe Louis Punch, a horse farm, the Louis-Rower P.R. Firm, and more. Although he had so many different business ventures, Louis would not find success in any of them. In total, Louis' fights earned him nearly $5 million. However, the IRS would demand $1.2 million in back taxes, interest, and penalties. In an attempt to recover from financial losses, Louis briefly turned to professional wrestling in 1956. 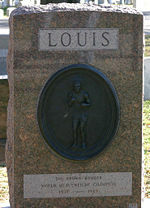 Joe Louis' headstone in Arlington National Cemetery. Louis remained a popular celebrity in his twilight years. In 1955, Louis married Rose Morgan and three years later he divorced her and married Martha Jefferson, who, in 1959, became the first black woman to practice law in Los Angeles. He also adopted four children in this marriage, in addition to two from his marriage with Trotter. A few years after his retirement, a movie about his life, The Joe Louis Story, was filmed in Hollywood. Because of Louis' financial hardships, an old army buddy, Ash Resnick, gave him a job welcoming tourists at Caesar's Palace hotel in Las Vegas, where Resnick was an executive. Louis' health began to deteriorate, and he had two operations paid for by long-time friend Frank Sinatra. Sinatra flew Louis to Houston to have famous heart surgeon Michael DeBakey perform surgery. Later, Louis suffered a stroke, and a year later his heart finally failed him. 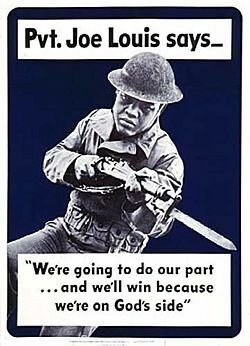 Joe Louis died of a heart attack on April 12, 1981. President Ronald Reagan waived the eligibility rules for being buried at Arlington National Cemetery, Arlington, Virginia, thus allowing Louis to be buried there with full military honors. Reportedly his funeral was paid for by former competitor Max Schmeling, but recent biographies (of both Schmeling and Louis) deny this fact. His life and his achievements prompted famed New York sportswriter Jimmy Cannon to write "Joe Louis is a credit to his race—the human race." Louis was posthumously awarded the Congressional Gold Medal in 1982. Louis was awarded the Congressional Gold Medal, the highest award given by the U.S. Congress, in 1982. In conferring the posthumous award, Congress stated that Louis "did so much to bolster the spirit of the American people during one of the most crucial times in American history and [has] endured throughout the years as a symbol of strength for the nation." In addition to having a street near Madison Square Garden named after him, Louis has a sports complex named after him in Detroit, the Joe Louis Arena, where the Detroit Red Wings play their NHL games. A memorial to Louis was dedicated in Detroit (at Jefferson Avenue & Woodward) on October 16, 1986. The sculpture, commissioned by Time, Inc. and executed by Robert Graham, is a 24-foot long arm with a fisted hand suspended by a 24-foot high pyramidal framework. It represents the power of his punch both inside and outside the ring. ↑ International Boxing Research Orgaization, All Time Rankings. Retrieved October 14, 2006. Adler, David A. Joe Louis: America's Fighter. Orlando: Gulliver Books, 2005. ISBN 0152164804. Barrow, Joe Louis, and Barbara Munder. Joe Louis: 50 Years an American Here. New York: McGraw-Hill, 1988. ISBN 0070039550. 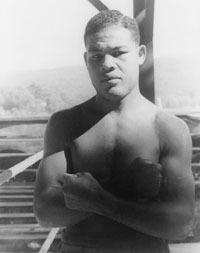 Jakoubek, Robert E. Joe Louis: Heavyweight Champion. New York: Chelsea House Publishers, 1990. ISBN 1555465994. Louis, Joe, Art Rust, and Edna Rust. Joe Louis, My Life. New York: Harcourt Brace Jovanovich, 1978. ISBN 0151463751. This page was last modified on 10 May 2018, at 19:04.